Here is the website [login to view URL], i need redesign of this website. required better color combination and fonts. below i am attaching the design for reference but this design i dont like. airboard - 1 sample design. 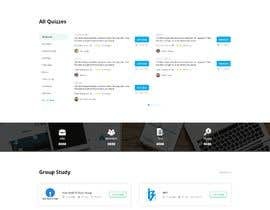 quiz (Categories and quiz) - start quiz button, total quiz, total time etc. Demo last is the concept of design required by me. please check. use proper icons - That means with every element, required to use icons, with each and every small elements such as Online Test, All Online Tests, Quizzes, Results, Admit Card, Answer Key, Syllabus, Time Table, Jobs, Group Study Etc. for their respective subsidiaries we require small icons for better graphical representation. on top menu which is blue, we need light grey. cover photo needs to be replaced but content should be the same which I provided. Working..I hope you will love it.